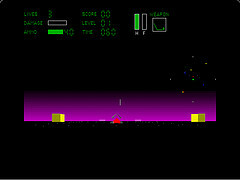 Ah, the purple horizon… the yellow cubic obstacles… the green bullets… the red enemy tanks. This is Spectre VR, a game I used to play in the early 90’s on my Macintosh LC. I was good at it too. I found me a copy and it turns out I can still run it on my Powerbook. I wonder if I can find someone to play me over the network (AppleTalk anyone?). And to all those women who will find me even more attractive after reading this entry about my tank maneuvering skills: Yes, I will let you win. Once. Ok where did you find a copy? I tried to reload my copy onto my old mac after repairing it and found my copy was damaged. Help! The music to this game is so great too–hehe I could never get used to the coasting option, but I loved to float by and blast enemy tanks while VR Bach was playing!